Back in March of 2001, Pat Bowman and I got the crazy idea to build a monster foamie for the Spring PSS Festival put on my the ISR guys in Riverside. 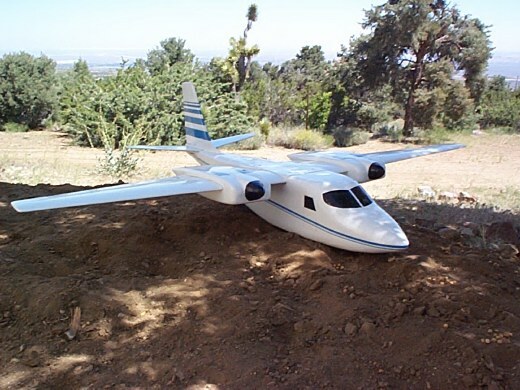 We wanted a high wing design with retractable landing gear. 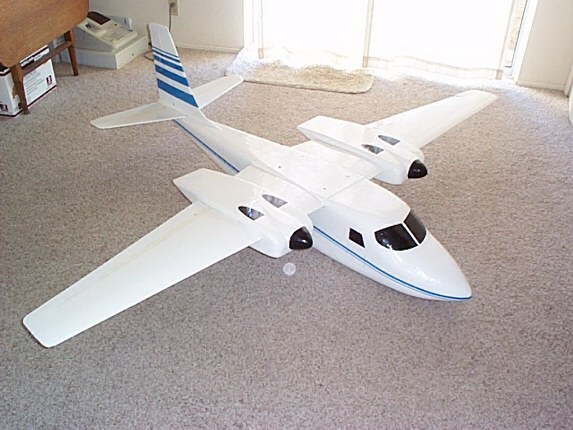 Brian Laird suggested building the Shrike Aero Commander and Pat and I agreed. Brian provided some scale drawings for us then we went to work. We mentioned the project to Joe Wurts up at Parker one day and he volunteered to design some airfoils especially for a ship of this size and planform. The wing has spars that I got from Don Richmond and hilaunch.com. It has a total of 10 carbon tubes in the wing. The fuselage is 10 inches square at its largest point. It is a solid chunk of 1.3 EPP. Pat looked like a snowman when he finished sanding the fuselage. 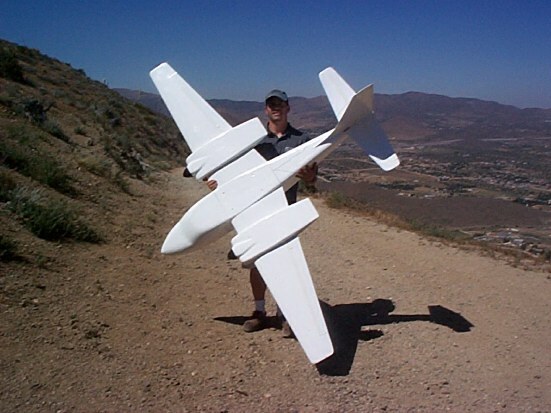 The tail is basic balsa construction. The total weight of the craft is around 13 pounds, over 3 lbs of that is lead in the nose used to balance the thing. The span is 96 inches. The nacelles are over 2 feet long. We first flew the Commander at Parker a day before the event. It flew straight and true right from the start requiring just a few trim adjustments. The lift was good and the Commander flew well. Controls were responsive and rolls were surprisingly quick. Its looks AWESOME in the sky. We flew it for about a half hour. I took it home and put some graphics on it...but by this time I was pretty tired and I didn't detail it out as much as I would have liked. Nevertheless, we loaded up the monster and took it the Cajon Pass for the contest. It was twice the size of anything else there. We ended up winning 1st place in the foam division. We had a lot of fun with this project but I don't think we will do anymore projects of this scope for a while. 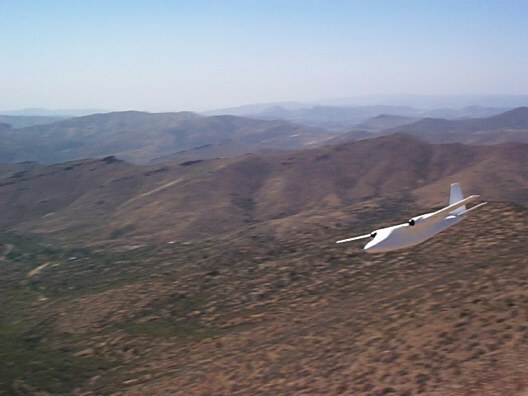 These next photos were taken before and during the test flight (no decals).